IT IS ALL DONORS MONEY? Under probe. Bank of Uganda officials appear before Cosase on Tuesday to answer queries on closure of commercial banks. PHOTOS BY ALEX ESAGALA. Probe. Bank of Uganda officials were on Tuesday grilled on how the value of assets of three closed commercial banks was reduced from Shs117b to Shs98b after the Central Bank took over the liquidation. 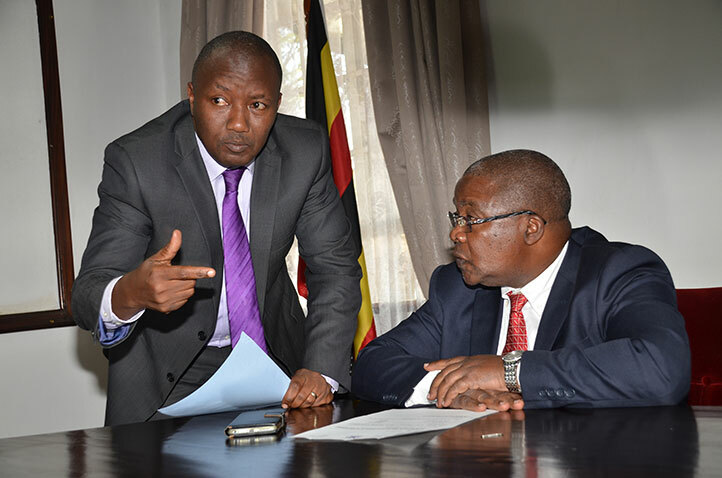 Governor Emmanuel Tumusiime-Mutebile contradicted his official, Mr Benedict Ssekabira, the director of Financial Markets Development Coordination, and Mr Katimbo Mugwanya, a BoU official, who had told MPs that they filed liquidation reports about the three banks. The BoU team was testifying before the Parliamentary Committee on Statutory Authorities, and State Enterprises (Cosase), which is investigating alleged irregularities in the closure of seven commercial banks by the Central Bank. The committee tasked BoU to produce the liquidation reports, which show movement of assets of the closed banks to subsequent owners. Mr Mutebile said BoU does not have the reports, although some of his officials had said the reports existed and had been handed over to the Central Bank. Solomon Arinaitwe covered the proceedings and brings you the highlights. Tumubweine Twinemanzi (director of supervision, BoU): Query 2:3:1 refers to the period when the Central Bank was the liquidator. The query is that starting 2002, when the liquidation role was performed by BoU, no detailed assets movements schedule or ledgers indicating assets at closure, sold, selling price, period of sale, assets not sold, performing and non-performing loans, was provided to support asset movements in the statement of affairs for the three closed banks. Although the statement of affairs as at June 30, 2016, indicated that all the physical loans and customer assets had been sold, BoU records indicate that the liquidator did not sell all the assets previously owned by Co-operative Bank. According to BoU, the titles are still in the custody of the Central Bank. Because of the incomplete asset movement schedules, [the Auditor General] was not able to verify the movement of assets from Shs117b at closure to Shs19b as stated in the statement of affairs of June 30,2016. The response at the time of BoU [takeover] was that we undertake to provide a full list of all the recoveries made against loans from the three commercial banks. The three title deeds for Co-operative Bank were not sold because of ownership disputes between the bank and the sitting tenant in Masindi and the three roads in Kampala were just roads connecting other plots that were sub-divided from another piece of land. BoU avers that the information shared with the office of the AG, especially as relates to loans and advances which were the majority of the assets of these banks, indicates what the balances were at closure, recoveries made, and interest accrued and outstanding balances. We think, in our opinion, that is adequate to explain the movement of assets. Abdu Katuntu [Committee chairman]: The Auditor General is saying that during the period when the role of liquidation was being performed by others, there were regular reports up to 2002 and they accessed those reports, I guess, by KPMG. In those reports, you could be able to see movement of assets. When BoU directly took over, those reports are not there. Now that those reports are not there, the AG could not verify the movement of assets. Why are there no reports during the time you are managing the process of liquidation of assets? Benedict Ssekabira [Director of financial markets development coordination]: Indeed there are no reports but I will have to explain why. ICB was closed in September 1998. KPMG, who was appointed as a liquidator agent by BoU, submitted a report only once throughout that time. That final report is dated September 30, 2001. There was no frequency of reporting from KPMG. Similarly, under Co-operative Bank, KPMG also reported only once in August 2001 and that was their exit report. In Greenland Bank, Delloite Touché were engaged from day 1. The issues in Greenland were heavier and more challenging. As for the terms of their engagement, they were required to issue frequent reports. That is why you see frequent reports from the Central Bank. In KPMG where frequent reporting was not required, they sat in there and only did reports when it was required. These are the differences that existed. Following the takeover by BoU, which happened in 2001, BoU did not want to report to itself because at that time, BoU was in charge of the liquidation and being in charge, it would not issue a report to itself. What we did was to appoint auditors in 2002 to audit the situations in 2002. Indeed there is a statement of affairs for each bank that was submitted to this Committee. Different auditors did audits on different banks under liquidation in 2002 because it is expensive to do audits every year. In 2005, another audit was done and after that audit, so many things were done like distribution of liquidation proceeds. This is the situation. Katuntu: Internally, which department was handling this particular exercise? Ssekabira: The Bank supervision department was handling this. Katuntu: Which organ of the bank was it reporting to? Sekabira: It reports to the Governor. Katuntu: Where are these reports to the governor saying we are doing this and this is the status? You must account. Every department of the bank should be able to account either to the governor or the board. Do we have any reports to the governor’s office or to the board? Tumubweine: Someone is always appointed through the bank to handle. Katuntu: And that person should be able to report to the Governor and that is what we want. Do you give somebody a job to do for four years and there is no reporting mechanism. Michael Tusiime [Mbarara Municipality MP]: The liquidator is here with us. The person who was given mandate and even paid an allowance is here with us- Mr Sekabira. Katuntu: Did you have reports to the bank on this process? One of the audit objectives of the Auditor General was to establish whether the liquidator appropriately managed the sale of the assets, accounted for the funds resulting from the sale and whether the receiver appropriately managed the transfer of the assets. We are looking at the management of this process and whether it was managed appropriately. There are no reports. Was it correct to have a liquidator without reports? Moses Kasibante [Rubaga South MP]: To emphasise the point, there must be a reporting mechanism. We are blessed to have the horse itself, the governor. Let us get it from the horse’s mouth. The governor and his deputy should tell us whether he got reports from the liquidator. Tumusiime Mutebile: I am sorry I do not remember receiving any reports about this matter. Katuntu: Under general laws of liquidation, you need to have reports because the assets you are dealing with are not yours. You have taken over assets of another institution, so the way you manage them, you must have an accounting mechanism. Ssekabira: The liquidator of closed banks has never been Ssekabira and that should be corrected. The liquidator for all closed banks has always been the Central Bank. Even when you see KPMG and Deloitte Touché, they have never been liquidators. They are agents of BoU. It is true that the governor may not have received the reports because Ssekabira does not report to the governor. Ssekabira was appointed as an agent of the liquidator and was reporting to somebody far below the governor. Those reports exist. The process of liquidation that we were using at the time would not leave you with a lot of authority either as a liquidator or an agent. You would not sit where we were sitting at Greenland Towers and have a lot of authority. Everything was done by the Central Bank. For example, if a debtor wanted to pay off their loan, they would not come at my desk to pay. The money would be taken to the Central Bank and paid and someone who has paid would come to me and say I have paid this money, can I be discharged. I would verify and take the process to release a title, for example. There was not a lot of authority given to the liquidator. Katuntu: You said there were no reports and you said you are under oath and, therefore, telling us the truth. Now you are saying there are reports which is a contradiction. That is why members are wondering what you are talking about. If those reports were there, you should have produced those reports because the query is saying there are no reports. We want to know the asset movement schedule from Shs117b to Shs19b. Do we have documentation to show movement of these assets? Mutebile: Mr Ssekabira said he had no reports to me because he was too far from me. He did not say which person that was. Who is this person whom he is not naming? Ssekabira: It was Mr Apollo Obbo, Ms Margaret Matovu and Ms Justine Bagyenda. The Commission of Inquiry into land matters has directed ministry of Finance to halt the payment of Shs 100 billion compensation to claimants of a rock underneath the Isimba power dam construction site. The directive is contained in a June 26 letter addressed to the ministry by Justice Catherine Bamugemereire, the land probe commission chairperson. "This letter serves to request that all payments due over funds appropriated in the 2018/2019 budget in respect of the rock reserves along Isimba hydropower project be halted. The Commission of Inquiry took interest in investigating the issue of compensation of rock reserves in respect of Isimba hydropower project," reads the letter in part. Bamugemereire told journalists at the National Records and Archives Centre that the Commission received a complaint about the compensation claims from Engineer Badru Kiggundu, the chairperson of the Karuma and Isimba hydropower project steering committee. In his complaint, Kiggundu said that a number of project affected persons (PAPs) were dully compensated by the government at the commencement of the projects but lodged fresh claims for additional compensation for the natural rock formations beneath their land. The compensation claims add up to Shs 600 billion. Bamugemereire says their investigations into the matter show that the PAPs were indeed compensated after consenting to the valuations reports. "The Commission has detected possible collusion between claimants and public officers in government offices such as the office of the chief government valuer, department of Geological Surveys in ministry of Energy and now perhaps, ministry of Finance," reads the letter. She says preliminary findings of the Commission indicate that the Shs 600 billion claim is baseless and probably driven by corruption tendencies. She, therefore, directed the Finance Ministry to withhold payment until the commission concludes its investigations into the matter and makes final recommendations. "The Commission is perturbed by reports that not withstanding the ongoing investigations, the ministry of Finance, Planning and Economic Development has earmarked Shs 100 billion out of the budget FY 2018/19 for payment of dubious claims in respect of Isimba hydro power project. The Commission strongly advises that any payment arising from the above claims before the Commission concludes its investigations will be premature and may in fact occasion financial loss to the government of Uganda. We therefore direct that any payment due to these persons be halted." said Bamugemereire. Some of the claimants for the rock at Isimba hydropower dam are Tom Musisi Kazibwe, the former Ntenjeru South MP and the former Kayunga town clerk, Charles Magumba. The two are demanding compensation of Shs 132 billion basing on a February 5, 2015 valuation report authored by the senior valuation officer, John Moses Magala. The others are nine Bibanja holders from Kayunga district who through lawyers from Galisonga & Co. Advocates sued the government and the Isimba dam contractor for nonpayment of Shs 203 billion for the rock on their land at Nakatooke village in Nazigo sub-county, Kayunga district where the dam is being built. The 183MW dam is being constructed at a tune of $567 million (about Shs 1.2 trillion). The dam, 40kms downstream from the newly built Bujagali hydro-power dam, is being financed by the Chinese Export and Import Bank (Exim). Such is the government expenditure which the children and grandchildren of the citizens of this country will continue to make as foreign loan repayments for the rest of their lives. Kampala, Uganda: Members of Parliament have opposed attempts by the Deputy Governor Bank of Uganda, Mr Louis Kasekende, to block a forensic audit by the Auditor General into the operations of the Central Bank and its role in the closure of four commercial banks. Mr Kasekende wrote to the Attorney General on April 19, 2018, protesting an investigative audit by the Auditor General on the resolution process of Crane Bank Ltd (in receivership) on grounds that such an inquiry offends the sub-judice rule. The Solicitor General, Mr Francis Atoke, wrote back to the BoU Governor on May 2 ordering the bank not to cooperate with either the Auditor General or Parliament regarding an investigation into the sale of Crane Bank on grounds that any such inquiry would offend the subjudice rule. But Budadiri West MP Nandala Mafabi, the lead petitioner for an audit into BoU, yesterday said Mr Kasekende was attempting to shield a “mafia” at the Central Bank and insisted the Auditor General must be given freedom to audit the bank. “Those are the mafias hiding what they have been stealing. In Tanzania, Bank of Tanzania was audited by the Auditor General and grand theft was discovered. I am certain that there is more plunder at BoU. It should account for all the closed banks,” Mr Mafabi said. He said the forensic audit should focus on the conduct of Ms Justine Bagyenda, the former director of commercial banks supervision at the bank and other officials who were charged with the responsibility of carrying out routine supervision of Crane Bank. The Shadow Attorney General, Mr Wilfred Niwagaba [Ndorwa East], said the Rules of Procedure give the discretion of interpreting whether an inquiry amounts to subjudice only to the Speaker and not a potential witness before a parliamentary inquiry. Mr Niwagaba said BoU cannot stop such an inquiry if the Speaker rules that it does not offend the law on subjudice. “It is the Speaker to decide that this matter is subjudice or not. The essence of the subjudice rule is not to prejudice a matter that is pending in court. Parliament is talking about an investigation to do with a forensic audit. How does a forensic audit affect the current proceedings between BoU and Crane Bank?” Mr Niwagaba asked. Mr Abdu Katuntu, the chairperson of the committee on Commissions, Statutory Authorities and State Enterprises (Cosase), has already protested to the Auditor General and BoU, insisting that the latter must provide documentation relating to the closure of Crane Bank. “Entities being audited do not have the liberty to choose what should be audited. The arguments being raised by the bank of subjudice do not apply to auditing. Your report may not be discussed in Parliament if in the opinion of the Speaker, it is subjudice,” Mr Katuntu wrote to the Auditor General and BoU. A motion to kick-start the setting up of a select committee to investigate the operations of the Central Bank remains on the Order Paper listed as business to follow after the Deputy Speaker Jacob Oulanyah ruled last year that Cosase and courts are handling similar matters. Mr Mafabi said Mr Oulanyah “needs to get to his senses “and also accused Mr Katuntu and vice-chairperson Anita Among of conducting parliamentary business using “underworld” methods. The dispute between Mr Mafabi and the Cosase leadership is over a letter Ms Among wrote to Mr Oulanyah insisting the committee was auditing the operations of Bank of Uganda, even before such an inquiry had commenced. Mr Oulanyah was not available for comment as he currently away in Israel on a working trip with the Parliamentary Commission. A draft forensic audit report conducted by the Auditor General that is supposed to guide the Parliamentary inquiry was deemed inadequate as it does not include the plight of Crane Bank and National Bank of Commerce. The Nigerian military dictator that was killed by his African sexual lovers. The African Oil bonanza: Kutesa was paid $500,000 bribe - US prosecutors insist. Uganda Foreign Affairs minister, Sam Kutesa was paid a $500,000 (about Shs 1.8 billion) bribe in exchange for obtaining "business advantages" for a Chinese energy company while he served as president of the U.N. General Assembly from 2014 to 2015. According to criminal complaints brought against two former ministers of Hong Kong and Senegal who have been arrested in New York, Chi Ping Patrick Ho, Hong Kong’s former Home Secretary, and Cheikh Gadio, a one-time foreign minister of Senegal, plotted to bribe Idriss Deby, the long-time president of oil-rich Chad and Kutesa to secure business deals and rights for a Shanghai-based energy and financial conglomerate. The bribery scheme was hatched in the halls of the United Nations in New York and spanned several continents. Kutesa was also allegedly used to extend gifts and promises of future benefits to President Yoweri Museveni, including offering to share the profits of a potential joint venture in Uganda involving the Energy Company and businesses owned by the families of the Ugandan Foreign Minister and the President of Uganda. According to a criminal complaint unsealed by U.S. prosecutors on Monday, Ho and Gadio engaged in a multi-year scheme to bribe Deby and Kutesa in exchange for "business advantages" for the energy company, a multibillion-dollar Chinese company that operates in the oil-and-gas and financial sectors. Ho was arrested Saturday afternoon and appeared before a federal magistrate Monday, the Justice Department announced Monday. Gadio, who served as foreign minister of Senegal from 2002 to 2009, was arrested in New York on Friday afternoon and presented to a federal magistrate Saturday. Both remain in federal custody. The two men are charged with criminal bribery in violation of the Foreign Corrupt Practices Act (FCPA) and international money laundering. The FCPA bars companies from bribing foreign officials to gain a business advantage. Acting Assistant Attorney General Kenneth A. Blanco said the scheme "involved bribes at the highest levels of two nations." "Their bribes and corrupt acts hurt our economy and undermine confidence in the free marketplace," Blanco said in a statement. According to the complaint, Ho and Gadio began plotting in 2014 when they met at the United Nations in New York. At the time, Gadio ran a consulting firm while Ho headed a non-profit that received funding by the energy company. The criminal complaint does not name the non-profit or the Chinese company behind it. But a small outfit named China Energy Fund Committee fits the NGO's description in the complaint. On its website, CEFC describes itself as an NGO and "high end strategic think tank" and lists Dr. Patrick Chi Ping Ho as its deputy chairman and secretary general. The non-profit says it is registered in Hong Kong and Virginia and is supported by "a special private grant fully sponsored by China Energy Fund Co. Ltd."
CEFC China Energy Company Limited is "a private collective enterprise with energy and financial serves as its core business," according to its website. The Shanghai- based company had revenue of $34 million (263 billion Chinese yuan) in 2015. On October 19, 2014, Ho met Kutesa at the United Nations. 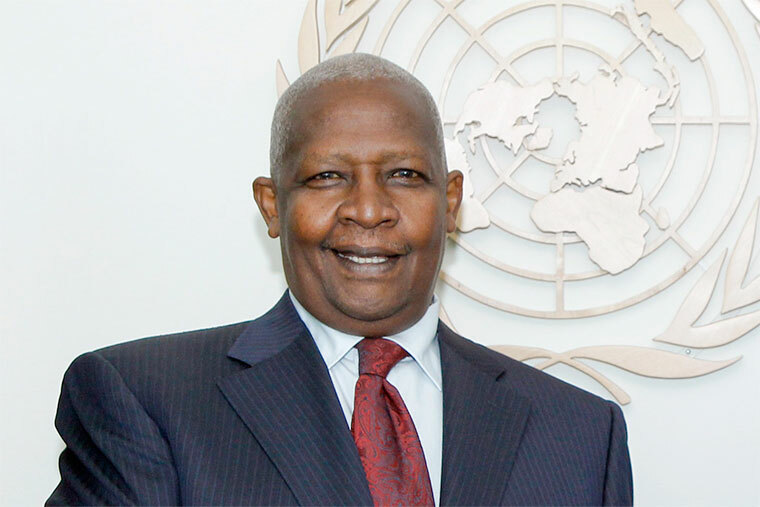 Kutesa had just begun his one-year term as president of the United Nations General Assembly. A month later, Gadio allegedly advised Ho to "reward" the Chadian president with "a nice financial package." Two months later, Ho pledged a $2 million bribe to Deby on behalf of the energy company in exchange for obtaining lucrative oil rights from the Chadian government. In exchange, Deby is alleged to have provided the energy company with "an exclusive" opportunity to obtain particular oil rights in Chad without facing international competition, according to the criminal complaint. Gadio is alleged to have connected Ho with Deby and conveyed the $2 million bribe offer to Deby. Ho is alleged to have paid Deby $400,000 for his services via wire transfers transmitted through New York. In addition, the criminal complaint alleges, Ho paid a $500,000 bribe to Kutesa, the Ugandan foreign minister, in exchange for obtaining "business advantages" for the energy company, including the potential acquisition of a Ugandan bank. According to the complaint, Kutesa solicited the payment from Ho, purportedly for a charitable foundation that he wished to launch. In around February 2016, the money was then wired to Kutesa's account through a bank in New York. In his communications, Ho variously referred to this payment as a “donation” to the reelection campaign of the President of Uganda (who'd already been reelected). Chad’s president and Uganda’s foreign minister were also offered gifts and promises of future benefits, including a share of profits generated by joint ventures between the energy company and businesses owned by the families of the foreign minister of Uganda and president of Chad, according to the criminal complaint. FBI Assistant Director In Charge William Sweeney of the New York Field Office said Ho and Gadio "were allegedly willing to throw money at the leaders of two countries to bypass the normal course of business, but didn't realize that using the U.S. banking system would be their undoing." Chad and Uganda are ranked the 15th and 25th most corrupt countries in the world, according to Transparency International's 2016 Corruption Perceptions Index. The embassy of Chad in Washington and Uganda’s mission to the United Nations in New York did not respond to requests for comment. FAMIRE e Luweero erumirizza Ssaabalamuzi Bart Katureebe okwekomya yiika 840 eze ttaka. Naye abaanukudde nti ako kabinja ka bafere abagenderera okwonoona erinnya lye n’okumuggyamu ssente ku ttaka lye. Yabagambye nti ettaka lye bayita eryabwe n’ekyapa kye batambula nakyo kyasazibwamu dda kyokka bagenda babuzaabuza abantu nti ekyapa kituufu. Agamba nti balowooza tasobola kuvaayo kwerwanako olwa ofiisi gy’alimu. Ebiwandiiko biraga nti omugenzi Samuel Kizza Gwonyoma yafuna liizi ya myaka etaano mu 1976 ku ttaka lino eriri ku Bulooka nnamba 980, ku poloti 19, ku kyalo Kabulamugwa ekisangibwa e Ngoma mu Disitulikiti y’e Nakaseke. Abaana b’omugenzi Gwonyoma abaakulembeddwa omusika John Bosco Walusimbi ne bannamwandu babiri okuli Ruth Kigongo ne Joyce Namuddu, baategeezezza nti bwe baafuna obuyinza obulabirira ebintu by’omugenzi tebaasooka kukitegeera nti ettaka lyabwe liriko ekyapa ekirala. Okukitegeera nga bamaze okuliguza Godfrey Banunu. Walusimbi yategeezezza nti emyaka gya liizi etaano gyaggwaako mu 1981 era kitaabwe teyasobola kuzza buggya ttaka olw’olutalo. Ebiwandiiko biraga nti mu 1995 yapangisa George Mugyenyi ku ttaka lye alundireko ente ebbanga lya myaka 10 okutangira ettaka lye obutabbibwa. Endagaano ya Mugyenyi yaggwaako mu 2005. Kigambibwa nti Mugyenyi ye yatwala abalala ku ttaka eryo nabo babapangise. Walusimbi yalaze endagaano eyakolebwa nga September 14, 2007 ng’eraga nti kitaabwe Gwonyoma yapangisa Omulamuzi Bart Katureebe (kati Ssaabalamuzi) ekibanja alundireko ente 100. Endagaano eraga nti yali ya myaka esatu nga buli mwaka ateekwa kusasula obukadde busatu, kyokka ye alaga nti ekiseera ekyo yali yagula dda ettaka eryo. Mu mwaka 2010, Gwonyoma yagwa ku kabenje ng’akyama ewuwe ne mukyala we Damalie Babirye ate ne mukwano gwe Mugyenyi naye n’afa mu kiseera ekyo. Walusimbi yategeezezza nti baafuna ebiwandiiko ebikwata ku ttaka lyabwe nga biraga nti liizi ye yazzibwa obuggya kyokka ng’ekyapa tebannakitereeza. “Twafuna obuyinza ne batuwa ekyapa nga tewali muntu yenna yeemulugunya nti yagula ku tatka lino. ” Yagambye nti ekiseera ekyo waliwo abantu abaali basenze ku ttaka eryo nga nabo balyekomezza. “Olw’okwewala entalo, twasalawo ekitundu awali abantu abalala tukisaleko era twakutula mu kyapa abalala ne tubaleka ebbali ne tusigaza ettaka lyaffe nga tewali alirinako kiwandiiko kirala,” Walusimbi bwe yagambye. Yagambye nti baalemwa okukozesa ettaka eryo ne basalawo okulitunda. Baaliguza omusuubuzi Godfrey Banunu ku bukadde 760 era nti yakebera bulungi ettaka n’ekyapa kyabwe nga tekiriiko nkaayana yonna era nga ky’ekiri kyokka mu kompyuta. Yagambye nti nga bamaze okuguza Banunu ettaka, kwe kubayita ku poliisi nti basaalimbira ku ttaka lya Ssaabalamuzi. Banunu gwe baaguza ettaka yagambye nti azze yeekubira enduulu mu ofiisi ez’enjawulo nga tayambibwa era ensonga yazitutte mu kakiiko k’omulamuzi Bamugemereire nga August 7, 2017 bamuyambe. Ebiwandiiko bya Ssaabalamuzi biraga nti ettaka yaligula nga December 1, 2005 okuva ku mugenzi George Mugyenyi ku ssente obukadde 280 era ekyapa aba famire ya Gwonyoma kye batambuza kkooti yalagira ne kisazibwamu. Omulamuzi okuligula yasooka kwetegereza bulungi nti Mugyenyi ye nnannyini ttaka lino. Endagaano eraga nti olukiiko olufuga ettaka ku disitulikiti y’e Luweero oluyitibwa Luweero District Land Boad lwatuula nga August 11, 2003 ne lusalawo awatali kwetemamu ne luwa Mugyenyi ettaka eryo era ebiwandiiko byonna weebiri. Ekiteeso kwe baaweera Mugyenyi ettaka kiri ku ‘minute 45’ (ekiteeso 45). Oluvannyuma Mugyenyi yaguza Ssaabalamuzi Bart Katureebe ettaka era endagaano zaakolebwa ekyapa kikyali mu mitendera gy’okukifulumya. Mu 2006, ekyapa kyafulumira mu mannya ga George Mugyenyi. Mu 2007, ettaka lyazzibwa mu mannya ga Bart Katureebe kuba yali yaligula dda mu 2005. Ssaabalamuzi Katureebe yagambye nti Gwonyoma yagenda okufa nga tebalina mbiranye yonna era nga naye akimanyi nti ettaka lirye. Yategeezezza nti ekizibu kyava ku muguzi Godfrey Banunu n’abaana kubanga bwe baalaba nga kitaabwe afudde ne batandika okukebera ebiwandiiko kyokka ne batagoberera bulungi abatudde ku ttaka baagendako batya. Yagambye nti baalaba empapula eziraga nti taata waabwe yali asabye ettaka kyokka ne batakebera oba baali baamuwa. Yagambye nti omugenzi alabika yamala ebbanga nga tazzizza buggya liizi ye ate George Mugyenyi yali yalisaba dda era ng’akakiiko kaalimuwa dda. Yategeezezza nti olw’okuba tebaafaayo kunoonyereza, baakozesa olukiiko olufuga ettaka ensobi ne babawa ekyapa ate ng’ettaka liriko ekyapa ekyasooka okukolebwa mu 2006. Yagambye nti omugenzi we yafiira nga ye alimazeeko emyaka etaano ate nga liriko ennyumba ye ey’obuwangaazi era nga lyonna yalisiba ffaamu nga liriko n’ente ezisoba mu 500. Yagambye nti olw’okuba baagala kumwonoona, eyagula ettaka eryo ayinza atya okusanga ebyobugagga ebyobuwangaazi ku ttaka n’atakola wadde okunoonyereza okumanya oba ettaka teririna bwannannyini! UGANDA, KAMPALA, In the case filed in the High Court, Bank of Uganda has submitted a detailed scheme of how Kampala businessman and property mogul Sudhir Ruparelia fraudulently sold himself Crane Bank and was the sole but disguised its ownership in the names of false shareholders. In the case documents now before the Commercial Court, a division of the High Court that handles business-related cases, BoU presents a detailed catalogue of what it calls dubious or fraudulent activities that took place in Crane Bank under instructions or knowledge of Mr Ruparelia. In the documents supporting the case against Mr Ruparelia and others, BoU states that the property mogul fraudulently took out $92.8m (about Shs334b) and another Shs8.2 billion of depositors’ moneGANDA, Kampala. In the case filed in the High Court, Bank of Uganda has submitted a detailed scheme of how Kampala businessman and property mogul Sudhir Ruparelia fraudulently sold himself Crane Bank and was the y from Crane Bank for personal gain. The BoU documents in court show that Mr Ruparelia and his associates Vivek Sharma and Rakesh Gupta created false invoices to bill Crane Bank for activities that did not happen. In 2014 and 2015, a company called Interdico was paid $80m (about Shs288b) on false invoices in order to move the money out of Crane Bank for purported construction work. Bank of Uganda further reveals that Mr Ruparelia created companies which were paid by Crane Bank for construction of the bank’s branches and installation of a core banking system. “By means of fraud described…, the plaintiff (Crane Bank in receivership) has lost $80m (Shs288b) and it is averred that the money was paid to persons, companies or other entities for the ultimate benefit of the 1st defendant (Sudhir) or his associates,” BoU states in its evidence against Mr Ruparelia filed in court on June 30, 2017. The central bank further avers that for no financial reason, the entire land where Crane Bank had branches, was transferred to Meera Investments Limited, another company owned by Sudhir. Then Crane Bank started leasing the land at Shs100m for 49 years and paying $6,000 in annual ground rent to Meera Investments. “The first defendant (Mr Ruparelia) failed to safeguard the plaintiff’s assets; and on the contrary, stole them or otherwise caused or permitted them to be extracted from and lost to the plaintiff,” the court documents state. The central bank submitted evidence showing that Mr Ruparelia had been violating the laws which had been put in place to regulate and prevent commercial banks from failing or collapsing. Bank of Uganda has told court that Mr Ruparelia, at the time of passing the law, owned about 66.7 per cent of Crane Bank. However, by end of 2015, he controlled 48.7 per cent of Crane Bank. Another company White Sapphire, registered in Mauritius, owned 47.33 per cent of Crane Bank. The central bank says the company is owned by a Kenyan banker and real estate mogul Mr Rasik Kantaria. However, the documents in court show that White Sapphire’s purported 47.3 per cent shares were actually “indirectly” owned by Crane Bank. “By means of illegal arrangements made with Kantaria and subsequently, White Sapphire as well as with Sanghani, the 1st defendant (Ruparelia) dishonestly concealed his ownership and control of the plaintiff (Crane Bank) from BoU…. The facts show that the 1st defendant fraudulently concealed his beneficial ownership of 47.33 per cent of the plaintiff behind Kantaria/White Sapphire,” the documents read in part. 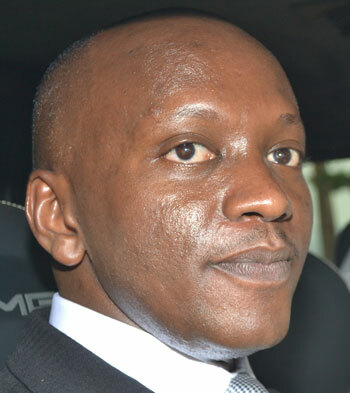 The central bank further states that Kampala businessman, Mr Godfrey Kirumira, through his company Premier Commodities, was used by Mr Ruparelia to carry out a transaction that indicated Kantaria had acquired shares in Crane Bank in 2010, whereas not. According to the documents Premier Commodities received $2.3m (Shs8.2b) as a purported loan from Crane Bank, but the money was repackaged and sent to Kantaria in India. After deducting a $50,000 (Shs180m) commission, Mr Kantaria remitted the balance back to Uganda as purported payment for shares he had bought in the bank. In November 2016, Daily Monitor tasked BoU to explain whether they knew the beneficial owners of White Sapphire considering it is an offshore company with no known directors. The BoU response was that proper vetting is often carried out. “Shareholders approved by the central bank to conduct banking business in Uganda are duly vetted as fit and proper based on criteria provided for in the law- and these also apply to shareholders domiciled elsewhere. From then on, the central bank conducts regular supervision of financial institutions and may take any relevant action based on the core objective of protecting depositors’ interests and financial system stability,” Ms Christine Alupo, the BoU director of communications, told Daily Monitor in November 2016. Yesterday, BoU declined to comment on the Crane Bank case, saying the matter was already before court and they were reluctant to discuss it in the public. According to the court documents, BoU accuses Mr Ruparelia of failing or refusing to remit more than Shs52 billion in workers’ contributions to the National Social Security Fund (NSSF). The central bank also accuses Mr Ruparelia of under-declarations on the payroll for Crane Bank’s expatriates for January 2007 to December 2016. “Crane Bank was a contributing employer for the purposes of NSSF Fund Act and as a controlling shareholder and director of the bank, Mr Ruparelia was under a duty to ensure compliance with provisions of the said Act by making full and truthful declarations of the number of local and expatriate employees and of its payroll and by remitting all requisite monthly standard and special contributions to the NSSF,” Bank of Uganda states. When asked why, for all this time, NSSF did not take action on Crane Bank’s default on workers contributions, Mr Richard Byarugaba, the NSSF managing director, said the pension Fund had discovered arrears of Shs52b and sent a demand notice to BoU. “This demand we have sent to BoU of Shs52b, the receiver of Crane Bank, arises from a whistleblower that approached us after the bank had been taken over by BoU. The whistleblower belongs to a small group of Indian experts who were brought in to work for Crane Bank but did not appear on the regular payroll of the bank and whose details were not available to us in our routine inspections. These are the employees who were colluding with the employer, Crane Bank, not to remit their NSSF contributions. They only came out to whistle-blow after they realised the bank had been taken over,” Mr Byarugaba explained yesterday. The Shs52b is broken down into Shs12.7b as arrears and interest due to members, and Shs39.3b being the statutory penalty for defaulting. Bank of Uganda took over Crane Bank on October 20, 2016 after the commercial bank’s capital was eroded to below the stipulated minimum level and depositors’ interests had been seriously jeopardised. Bank of Uganda said this was due to the bank’s Non-Performing Loans (NPLs). The central bank conducted a forensic audit to ascertain the cause of NPLs. By end of 2016, Crane Bank’s losses had hit a staggering Shs435 billion. On January 27, 2017, dfcu Bank acquired some of the assets and liabilities of Crane Bank. Mr Ruparelia and his co-accused have been given 15 days to defend themselves but by the time of filing this story, they had not submitted their defence to court. Fraud. 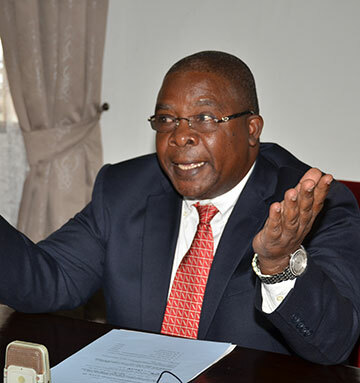 BoU states that the property mogul fraudulently took out $92.8m (about Shs334b) and another Shs8.2 billion of depositors’ money from Crane Bank for personal gain. Breaking the laws. The central bank submitted evidence showing that Mr Ruparelia had been violating the laws which had been put in place to regulate and prevent commercial banks from failing or collapsing. Failure to make payments. According to the court documents, BoU accuses Mr Ruparelia of failing or refusing to remit morethan Shs52 billion in workers’ contributions to the National Social Security Fund. Court rules. Mr Ruparelia and his co-accused have been given 15 days to defend themselves but by the time of filing this story, they had not submitted their defence to court. Kampala. Ministry of Defence officials and senior army officers have been put on the defensive over claims of regional imbalance in appointment of ministry officials. Defence minister Adolf Kasaija Mwesige, who led the team, fended off criticism from mainly Opposition members of Parliament’s Defence and Internal Affairs Committee. Shadow Internal Affairs minister Muhammad Kivumbi (DP, Butambala) sparked the debate when he told Mr Mwesige that the army appointments were “fairly absurd, skewed in favour of one region”. The Uganda People’s Defence Forces (UPDF) leadership has previously been criticised by the Opposition as being dominated by the officers from western Uganda, an allegation the army has dismissed. Lt Col Bright Rwamirama, the State minister for Veteran Affairs, said Mr Kivumbi’s statements were incorrect since the region [western Uganda] has a less representation in the ministry. “It is not fair to read names selectively…even the region they are saying to be a majority is a minority,” the visibly irritated minister retorted. The Chief of Defence Forces, Gen David Muhoozi, said the leadership is sensitive to regional balance. Opposition MPs also wondered why the Opposition FDC president, Maj Gen Mugisha Muntu, is not invited for UPDF top organ meetings yet he is listed among the members of the UPDF High Command under the UPDF Act. In response, Gen Muhoozi later told Saturday Monitor that nobody has stopped Gen Muntu from attending the army council meetings. Commenting about the UPDF withdrawal from the Central African Republic where they have been hunting Joseph Kony and his Lord’s Resistance Army (LRA), Gen Muhoozi said the UPDF has managed to “degrade” the LRA, saying the success of the mission against the LRA should not be judged basing on Kony being alive. “It is true of all the senior leaders, only Kony is still alive but I think it won’t be fair to judge the success of the mission by Kony being alive. LRA is no longer an immediate threat to Uganda,” he said. The ministry of finance has admitted that the process of releasing Shs 6 billion reward to public servants following a successful oil arbitration case was irregular. Finance officials including the minister Matia Kasaija, permanent secretary and secretary to treasury Keith Muhakanizi and director budget Kenneth Mugambe were appearing before the parliament's Committee on Commissions, Statutory Authority and State Enterprise (Cosase) on Friday this week. They noted that it was a mistake for an accounting officer of Uganda Revenue Authority (URA) to process payment without the permission from the minister. Section 25 of the Public Finance Management Act states that, before an accounting officer processes payments, he or she should get the approval of a minister. The committee was informed that although the URA commissioner general Doris Akol wanted a supplementary budget in FY 2015/16 for the reward of the public servants, the permanent secretary had advised the commissioner general that a supplementary budget was not feasible. On requesting the minister, instead it is the permanent secretary that responded to the request contrary to Section 25 of the Public Finance Management Act which gives powers to only the minister to allow for supplementary budget. Tumuhiirwe Turyamuweza, a member of the committee and MP for Rujumbura county questioned the finance officials on whether it was regular for the permanent secretary to sanction the funds instead of the minister. “When asked, the commissioner general said when we asked which authority she proceeded under to process the payment - she said she did not know how things were being done at the ministry of finance. That, she received a letter from the PSST (permanent secretary/secretary to treasury). And, we put it to her, and now, am putting it to you Hon. minister that, Section 25 of the Public Management Finance Act allows the minister only through the PSST to allow expenditure under supplementary. Now, do you have an authorisation you gave, or there was no request according to me..?” said Turyamuweza. Kasaija stated that he directed the permanent secretary to work on the expenditure under supplementary budget since he was busy engaged in campaigns. He says it is irregular for an accounting officer to spend money without permission from the minister, adding that they have now learnt from their mistakes. He said this should not have been the case as the law is clear on who should authorise the supplementary budget. The PSST Muhakanizi, on his part said, he acted as he was directed by his minister. He said he consulted with the minister and the minister said he was willing to give a supplementary. “First of all, I have already said [that] whatever was going on written or unwritten, we were consulting the minister. That should be on record…She [Doris Akol] first wrote to me if I can recollect. I said, please check reallocation that was on 15-16th [December 2015]. Now the vote happened on 16th and ended. On 17th, she asked for a supplementary which is illegal to the extent that it was not budgeted for…When she asked for a supplementary, I asked the minister and the minister said ‘am going to give her supplementary”, Muhakanizi said. Committee chairperson, Abdu Katuntu questioned whether it was correct for URA who had already spent the money from a budgeted item, to ask for supplementary to replenish what they had already used. The committee seeks to find out, under what law did URA commissioner general Doris Akol released the money. The ministry also stated that it was an error for the money requested for to appear as money for teachers' pay instead of a bonus for the civil servants. Five officials from the ministry of finance received part of the Shs 6 billion 'presidential handshake.' Muhakanizi received Shs 67 million. According to Muhakanizi, he was not aware of the fact that he would be rewarded, but only welcomed it since he was not doing well financially. The minister said he “did not receive even a single coin” from the payment. At the edge. One of the UTL offices in Kampala. FILE PHOTO. UGANDA, Kampala. For years, Libyans and other senior managers at Uganda Telecom (UTL), with the knowledge of ministry of Finance officials, paid themselves handsomely and enjoyed free water and electricity, schools fees for their children and housing allowances, Saturday Monitor can reveal. Although the company managing director (MD), Mr Mark Shoebridge, blames thieving and other fraudulent practices by UTL employees alongside a mountain of debt that distressed the company, Saturday Monitor investigations, however, point to what sources and MPs have called “obscene pay” of the top bosses and a long spell of financial indiscipline. For instance, UTL staff payroll for October 2016 shows that the top four managers – the MD, the Chief Finance Officer, the Chief Legal Officer, and Chief Commercial Officer – earn a combined salary of $95,583 (almost Shs400 million) per month. The MD earns a gross salary of Shs121m per month, followed by the Chief Finance Officer, Mr James Wilde, who pockets Shs95.2m. Mr David Nambale, the Chief Legal Officer, takes Shs90.5m, and Mr Ameer Kamal Arif, the Chief Commercial Officer, walks away with Shs76.4m. Like other employees, Mr Kamal, a Libyan national who earns a salary of almost Shs50 million per month, is also entitled to housing allowance of more than Shs11.9 million, acting allowance of 12.3million, schools fees of about Shs3m, water and electricity of Shs3m per month. However, it’s not clear whether school fees allowance is paid to the top managers per month or per term/semester. Mr Mafabi on November 17 last year informed Parliament that the UTL chairman board of directors, Mr Stephen Kaboyo, had his allowance increased from a net of $1,500 (Shs5.1m) to a net of $5,000 (Shs17.2million) per month with effect from September 2016. Realising that UTL was on its deathbed, the Libyans, who controlled 69 per cent stake in the company, pulled out, compelling the government to repossess the troubled company. The debt-stricken telecom where government owned 31 per cent stake, is now on the verge of collapse should government fail to invest or find a risk-taker, who is willing to inject in excess of $48m (more than Shs172.5b) into the company. The salaries for the top four managers combined, is about a third of the total salary bill for the entire company of about 500 employees. These salaries, according to Mr Mafabi and members of the House Select Committee investigating what has now become a scandal, must be among the highest for such staff in any company in Uganda. Although the company introduced some cost-cutting measures, including cutting down the number of expatriates from eight to two, the UTL board of directors and the top management continued to enjoy huge perks at the expense of the low-cadre staff. Besides, Mr Mafabi told Parliament that the mileage allowance that operational staff used to get for field work in the absence of company transport was recently removed in the name of cost cutting, including provision of tea in office. Saturday Monitor understands that half of UTL’s fleet was also grounded in September 2016 and nearly half of the remaining fleet is currently down with various repair needs as a result of delayed servicing and repairs, a situation that has affected network maintenance which has led to increased network degradation. When contacted, Mr Julius Kapwepwe, a director at Uganda Debt Network, described the UTL saga as “a true reflection of how debt is slavery” and that it also represents how bad the situation is with insider trading, among several other public sector institutions. Mr Kapwepwe and other people who talked to Saturday Monitor wondered why ministry of Finance didn’t raise the red flag when things were falling apart at UTL. “We need to beef up public accountability, including empowering the Auditor General to periodically comb through all public institutions and companies such as UTL, National Housing, Lugazi Sugar Works and others where there is public interest. Funds lost in such scams deny Ugandans service delivery, yet no one takes personal responsibility for the mismanagement and failures,” Mr Kapwepwe said. Although Mr Mugunga appeared to deflect the questions to the top management, the UTL MD and the board chairman, including some select senior officials at UTL, said they were in a meeting at the ministry of Finance headquarters and, therefore, were unable to comment. By press time, the meeting to discuss the future of UTL, chaired by finance Minister Matia Kasaija, was still on-going. • Mark paid himself more than $18,000 (about Shs64m) in school fees (compared to his contractual entitlement of only ($6,000 or Shs21m). • Mark also received $30,000 (more than Shs100 million) for his personal rent for the first six months next year at the rate of $5,000 (about Shs18m) per month although he is entitled to only $3,000 (about Shs11m) per month. • Emmanuel Kasule was paid almost Shs50 million in August 2016 even before he started working with UTL in September 2016. He was paid an additional $6,000 in November before the previous one was recovered. • Ayub Mulumba was paid Shs12 million in October 2016. • James Wilde’s rent for the period of January to June $30,000 (at the rate of $5,000 per month) was paid in November compared to his entitlement of $2,000 per month. Previously, $15,000 had been paid for the period of October to December 2016. The payments are in complete contrast to the company’s dire financial situation. The shrinking network and poor services. At the time of government takeover, Lap Green inherited a very good network with about 600 sites providing mobile, fixed line and data services. Apart from the heavily vandalised cable network, the mobile network has shrunk. This is a result of sites being closed and, or, cannibalised to be used as spares as the company cannot even afford any spares, failure to provide fuel regularly and fuel being stolen. Closing sites is going on even in areas where there high demand and where other service providers (MTN, Airtel, and others) are continuously expanding and improving their services/networks. Non-Auditing of company accounts. For many years now, no auditing has been done on the company accounts. This is the reason why it took long to detect a fraud that went on for years where petty cash was siphoned to the tune of more than Shs1.5 billion. The Parliament’s budget committee has for the second time rejected a presentation from the Ministry of Finance on how the sh23.9trillion Parliament appropriated for the 2015/16 national budget was utilized. The State Minister for Finance David Bahati had led officials with a summary report of 13 pages to explain how the money was utilized. Bahati was last week sent away over what committee members tagged an empty presentation without the real accountability they had wanted to see. The Public Finance Management Act which was assented to in February 2015 created a new measure in section 18 which requires the finance ministry to present an accountability report on how public funds in the national budget are utilized as an intervention for promoting more accountability. "We expected to see how the money we gave you was utilized. Why are you hiding state house and the office of the president? For the 24trillions we gave you to give us this is an insult. You have to properly account for public funds" Dokolo woman MP Cecilia Ogwal said. "The minister has mastered the art of dodging key questions. If URA collected sh11.3trillion, give us a breakdown of where that money came from. How much did each entity get out of the sh11.3trillion. All these details are lacking" Aruu County MP Odonga Otto said. West Budama North MP Richard Okoth Othieno tasked the minister to explain why nearly all the ministries performed below the expected targets. "The ministry of works performed at 66%, agriculture performed at 70%, the ministry of water and environment performed at 61%. The education ministry performed at 74%. The health ministry performed at 71%. 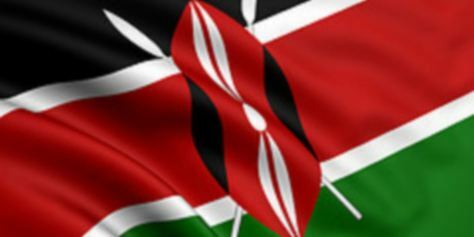 Where is the problem that all ministries are not fully meeting the targets," Othieno stated. In his presentation, the minister said its necessary for better service delivery which included strengthening monitoring and supervision, improved communication within state agencies, and compliance to procurement laws. In the works and transport sector, the minister said the challenge of inadequate road equipment for districts will soon cease to be a problem because government has procured road construction equipment from Japan which will be delivered in April this year. Bahati suggested to the committee to summon various ministers and heads of other state institutions to give accountability to the committee on how they used the money allocated to them in the previous financial year. “What we appropriate is not what the ministry of finance releases and we think that as parliament we are wasting this in the budgeting process. Many businesses are collapsing because government has failed to pay what it owes them” trade committee chairman and Fort Portal Municipality MP Alex Byarugaba said. The budget committee in its report for the 2017/18 budget noted that the sh110b government has proposed to allocate to clear part of the total bill of sh1.7trillion in domestic arrears is too little and that more money should be allocated. An official of the ruling political party in Uganda, NRM, has taken over an African Lake Island for himself. Serere District local leadership has instituted an investigation into how Mr Mike Mukula, the National Resistance Movement vice chairperson for eastern region, acquired a 2km island on Lake Kyoga. The investigations were started after residents petitioned the district council and the office of the Resident District Commissioner (RDC), accusing Mr Mukula of heavily deploying soldiers who are harassing and barring them from accessing the Namulemuka Island. Mr Edward Onya Akonopesa, the Serere RDC, said they have summoned Mr Mukula on several occasions to explain to the people and the council how he could have acquired the land but he has not yet heeded. “It’s a serious matter for which Serere District leaders are going to investigate him through the Ministry of Lands,” he said, adding that the Island in question was a property of Teso local government, presently Serere District. Mr Kokas Kedi, one of the petitioners, told Daily Monitor the soldiers almost threw him in the lake when he attempted to access the property last week saying no resident is allowed to set foot on the island. “Before I learnt fishing when I was 10 years, 30 years ago, our parents cultivated on that island and people went fishing on it, how did Mukula come to own it?” Mr Kedi asked. Serere District vice chairperson Benardettee Akol said there are continuous complaints from people and more so those fishing about harassment. “This shouldn’t be happening because people are questioning how he acquired the island,” she said. When contacted, Mr Mukula said the RDC and team should stop using sinister moves to undermine his ownership of Namulemuka Island. “I bought that Island 25 years ago, who is he to question how I acquired it even when eight RDCs who have served in that position have not questioned it,” he explained. Mr Mukula also denied claims that he has deployed soldiers on the said island who are harassing civilians. “People who are there are former arrow boys manning my farms. It should go on record, I legally acquired that land 25 years ago, and there is no need for panic. I am the right owner of the island,” he said. Kagwara LC1 chairperson Emmanuel Amaitum said the island has already been demarcated. “We, as local leaders, were not contacted to that effect but what I know is [Mr] Mukula is owning that island illegally,” he said. In Uganda because of the poor record of the IGG, to investigate corruption successfully, a private citizen has come out with one case to investigate the Uganda Army. The IGG Justice Irene Mulyagonja and some of the NRM Elites of the Uganda Army. UGANDA, Kampala- The Inspector General of Government (IGG) has opened up investigations into a scam in which government lost more than Shs2 billion through the maintenance of a suspected ghost Russian pilot on its payroll over a period of 11 years. The spokesperson of the Inspectorate of Government, Ms Ali Munira, told Daily Monitor last week the investigation was precipitated by a complaint lodged by one Aron Bakunda, a private citizen. In August, this newspaper published a story, which indicated that between October 2005 and February this year, the army paid a ghost pilot, one Valeri Ketrisk, alias Valerie Ketriski SK, $618,000 (approximately Shs2.07b) in monthly salaries and another $120,000 (approximately Shs402m) in gratuities. This loss came to light in June after a team appointed by the Chief of Defence Forces (CDF), Gen Katumba Wamala, to investigate the matter, released a report that implicated the Chief of the Air Force, Maj Gen Samuel Turyagyenda, and nine others for alleged connivance and negligence. Maj Gen Turyagyenda has since denied involvement in the scam. “I was not involved in any way. My signature and stamp were forged,” Maj Gen Turyagyenda recently told Daily Monitor. Some of the nine cited by the investigators led by Maj Martin Nsengiyunva, Mr Erias Mparana, principal human resource officer in the Ministry of Defence, Sgt Beswel Kutosi and Maj Lubega Kapalaga, of Uganda Air Force, Ms Caroline Kyakabale and Lt Col Grace Kyomuhendo of the Chieftaincy of Military Intelligence. Others are one Maj Bumanya of the Army’s legal department, Ms Goretti Nansove of the Air Force, Lt Komunda and Maj Zakama. Both Lt Komunda and Maj Zakama have since died. In his November 23 letter to the IGG, Mr Bakunda accuses the Permanent Secretary in the Ministry of Defence, Ms Rosette Byengoma, of refusal to comply with guidance from the Chief of Defence Forces on how to proceed with the investigation. “The purpose hereof is to forward the preliminary investigation report and request that you appoint one of the MoD [Ministry of Defence] officials to join an audit team to be headed by the D/CDF [Deputy Chief of Defence Forces] in this matter,” Gen Katumba wrote in the June 18 memo to Ms Byengoma. Mr Bakunda now accuses Ms Byengoma of having shelved the report in order to protect one of the implicated officials who is said to be her relative, a charge which she denies. “Why should I shield anyone who has caused financial loss to the institution when I very well know that it can cause me problems? Whoever is telling you that must be wishing me the worst. I can never cover up for such [fraud],” she told Daily Monitor in a recent text message. However, Mr Bakunda alleges selective application of the law, arguing that whereas other officers who had been accused of fraud and other offences had been forced to step aside to allow for investigations, those involved in the ghost pilot’s scam have not been forced to follow suit. In July 2013, the deputy Executive Director Uganda Media Centre, Col Shaban Bantariza, was forced to step aside after he appeared before the General Court Martial to answer charges of fraud, but was reinstated in June last year after he was found innocent. In August, the UPDF’s Chief Political Commissar, Col Felix Kulayigye, was sent on forced leave pending investigations into allegations that he was involved in a Shs200m gold deal that went bad. He was recently cleared of wrongdoing and reinstated. Mr Bakunda is demanding that the same standard, which was applied on Colonels Bantariza and Kulayigye, be applied to those cited in the ghost pilot’s scam. The Infamous Inspector General of the Military Police in Uganda, General Kale Kayihura. MPs on the Public Accounts committee want the auditor general to conduct a forensic audit into the financial records of Uganda Police Force for the financial year 2014/2015, writes JOSEPHINE NAMULOKI. Members of Parliament have stepped up efforts to recover the land title for Kawempe police station, after it went missing from the Uganda Land Commission (ULC). On Friday, the Public Accounts committee learnt that the land title disappeared in 2010 but nothing has been done to establish its whereabouts after Rogers Muhirwa, the police under-secretary, pushed the responsibility to ULC, the custodians of government land. Muhirwa was leading a delegation of police top brass, including assistant inspectors general Edward Ochom, Andrew Felix Kaweesi, Stephen Kasiima and Andrew Soroweni, among others. Muhirwa said ULC was the one in possession of the land title before it disappeared. “The land title at Kawempe police station was handed over to ULC with original copies of signed transfer. After sometime, we asked them to avail us with satisfactory copy, but they wrote to us that they don’t have the land title,” he noted. Muhirwa added that the force has written several letters to establish how far the search for the missing title had gone, but ULC’s response has been that police are simply users of the land and ULC are the owners of the land. The committee also learnt from the auditor general’s report that the force has only 102 land titles out of 715 it possesses countrywide, leaving 613 titles at risk. Police, however, disregarded the report, reasoning that police possesses only 675 land pieces, and not 715. The AG report of 2014/2015 financial year further questions how police spent Shs 445 billion to train only 82 police officers. officers were trained. Parliament is yet to get accountability on how the balances were spent. The committee was also shocked to discover that there are no documents detailing the Shs 9.6bn purchase of land located in Bwebajja, along Entebbe road, which now acts as the Police Senior Command and Staff College. The auditor general’s report queried the procurement process, indicating that the acquisition was in contravention of the PPDA regulations. Muhirwa, however, explained there was need to have restrictive bidding because police was procuring a security and sensitive facility. Police spokesman Andrew Kaweesi added that the country lost its only training college in 1987. “Police had a college in Naguru but government gave it out to United Nations. From that time, we have been at the goodwill of other institutions like UPDF and Prisons. That’s why we decided to get our own facility as a matter of urgency,” he said. Owing to the various queries, MPs on the committee now want the office of the auditor general to carry out a forensic audit into the financial records of Uganda Police Force for the financial year 2014/2015. “There is a problem of accounts; so we are recommending a forensic audit. We shall not proceed with other queries before the forensic audit,” Osegge ruled. Andrew Ayo, the former Kole district malaria focal point person has offered to return more than Shs 17m he is accused of embezzling following his arrest two weeks ago. Ayo says he has agreed to refund the money and take responsibility that it disappeared from under his watch but not to admit guilt and culpability. He blames the Kole district health officer for the loss of the money, which was meant for the training allowances of Village Health Team (VHT) members. According to Ayo, his only problem was failure to monitor the project efficiently, which led to the loss of Shs 17.3m. Ayo says he has written to Kole chief administrative officer (CAO) requesting for time to pool resources together to reimburse the missing funds. Stephen Monday, the Kole CAO, says he is only handling the administrative implications of the matter and still awaits official accountability from Ayo. He says police have already taken over the criminal aspect of the case. He says he will decide what action to take once he receives the expenditure report from Ayo and not his pleas to be pardoned after refunding the money. Jimmy Agaba Mogi, the Kole district Criminal Investigations Officer, says they are still recording statements from more complainants whose funds were allegedly swindled by the officer. Mogi says Ayo was released on bond as investigations into the case continue. Pension fraud in Uganda continues in the public service as the courts try to stop it. The Auditor General has established that the money originally budgeted for as social security contributions (NSSF) formed part of the money that was paid out to ghosts, the court has heard. Prosecution led by Barbra Kawuma asked the Anti-Corruption court presided over by Justice Lawrence Gidudu to find that no payment was made to NSSF as per budget. "The letter from the Chief Administration Office and the Auditor General's reports show that the money was stolen through ghosts who are not traceable. The only people who should account for where the money is ,are the accused persons," She said. After presenting her final submissions, Kawuma asked court to find the accused persons that committed the said crimes and convict them accordingly. The former Public Service Ministry officials who include Jimmy Lwamafa(Permanent secretary), Stephen Kunsa Kiwanuka (director research and development) and Christopher Obey, (principal accountant) were indicted on ten counts of causing financial loss, Abuse of office, corruption, false accounting by public officer, conspiracy to defraud and diversion of public resources. The charges stem from the alleged fraudulent budgeting of sh88b of civil servants' pension contribution to NSSF knowing that civil servants do not contribute to NSSF. Kawuma argued that the accused irregularly spent sh88b in the said financial years, adding that Lwamafa and Obey were signatories to the Public Service Electronics Funds Transfer (EFT) salary account, where the said money was released from. She added that the duo also authorized the payments in question. She argued that Kiwanuka, as head of the Compensation department was aware of the actions of Lwamafa and Obey because he was responsible for budgeting, expenditure and accountability. Kawuma said if Kiwanuka denies taking part in the expenditure, then he neglected his duties without any justifiable cause and asked court to invoke section 19 of the Penal Code Act (PCA) to show that he abetted and aided the crime to enable Obey and Lwamafa to irregularly spend the said money. Citing section 20 of the Penal Code Act (PCA), she pointed out that when two or more persons form a common intention to prosecute an unlawful purpose in conjunction with one another, each of them is deemed to have committed the offence. "All the accused had knowledge to believe that their act would cause financial loss to government. The trio budgeted the said money for NSSF to ensure that there were available uncommitted funds to steal," Kawuma noted. Referring to evidence of prosecution witness nine Dr. Christopher Makanga, she said payments were made to persons who could not be traced in the records of the Ministry save for the personal computers of Obey and that the payments were not backed by personal files or verified and cleared by internal audit. She submitted that the accused knew that the Ministry of Public Service was not supposed to contribute to NSSF and they ended up furnishing false statements or returns of the money. This evidence, she said was backed by the testimony of prosecution witness one, Henry Mutegeki, who did another audit in 2015 and was not able to access the records of beneficiaries. According to court documents, in financial year 2010/2011 and 2011/2012, Ministry of Public Service made budgetary provision of sh44b for NSSF, for each year and the funds were released to the ministry and spent. She stressed that exhibits tendered in court like the ministerial policy statements prove that the accused spent the said money. It further reported that the sh44b NSSF budget was utilized by the Public Service Ministry and according to their annual financial statements and the Ministry's quarterly progress reports; the money was expended towards NSSF Social Security contributions. However, police investigations revealed that no payments were made to NSSF and there were no known beneficiaries at the Public Service Ministry but that it was stolen through ghosts disguised as pension gratuity. The case was adjourned to September 15, when the defence team is expected to make their submissions in reply to prosecution's allegations. In the Parliament of Uganda, over 450 MPs are sitting in this small house. Parliament will spend over Shs 64 billion on the purchase of vehicles for MPs of the 10th Parliament. 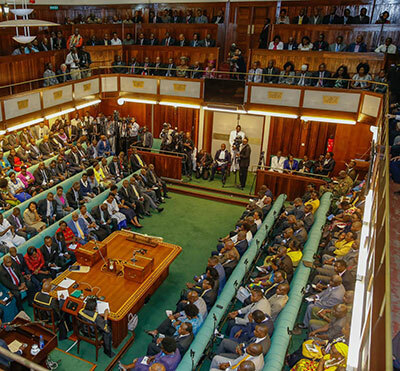 Each of the 427 Members of Parliament will receive an allocation of Shs 150 million according to a budget outline by the Parliamentary Commission. The figure is up from Shs 38.6 billion spent on vehicles in the 9th Parliament that had a total of 375 members. Each vehicle for an MP in the 9th parliament cost Shs 103 million. Chris Obore, the director of information at Parliament, said the funds will be released regardless of on going petitions against some members. Initial reports indicated that the money would be held until courts dispose off all electoral petitions. Up to 118 petitions were filed against Members of Parliament in the aftermath of the 2016 parliamentary election. But Obore said that Parliament cannot deny legislators their benefits because of pending petitions. "We shall give the MPs what is due to them. We can't stop paying MPs money for vehicles and other emoluments because of petitions in court", Obore said. On the likely loss to be met by the taxpayers when an MP who has already received money for the vehicle loses a seat, Obore said that the duty of the Parliamentary Commission is to take care of the welfare of MPs and staff and that only the law can enable the commission to reduce loses and recover vehicles once an MP loses a seat. Obore added that iPads will be given to every MP who is on the Clerk's record in two weeks' time regardless whether they have election petitions against them or not. “The money that will be easily available quickly is the money for iPads and they will be given each of them. When they get kicked out, they get it as MPs. The difference now here is that, the iPad will be returned because it doesn’t belong to an MP as entitlements. It is property of the parliamentary commission. So to alley your worries three [iPads] were returned, the rest we chopped their money; Shs 500,0000 from each. So, your worry of saying that they will go with iPads is allayed because we shall recover because it is not property of the MP. It is just given to facilitate the work”, he added. Amolatar Woman MP, Doreen Ruth Amule said that the delayed payment of the vehicle allowance is stressing new MPs who have not had cars before since they have no means of transport. "But also in financial control, you know in the previous experience in the 9th Parliamentary there were members who had court cases and they were facilitated with this money to buy cars and you know this is something, which is not refundable. So if Parliament felt so, it would be wise but I would think, the best way is to handle first come, first serve in terms of those who are cleared [of election petitions]. Those who are cleared should be facilitated because they don’t have any issue as to why they should wait. But those who have pending cases then they should also be given in the second shift", she said. The latest shortlisted candidates are to be interviewed between April 27 and 30 this month at the Uganda Bureau of Statistics (UBOS) offices on Sixth Street in Industrial Area. Some of UNRA jobs applicants lining up to submit their credentials recently. The Uganda National Roads Authority (UNRA) has shortlisted another batch of over 2,000 candidates who are to be interviewed for various jobs. The latest shortlisted candidates are to be interviewed between April 27 and 30 this month at the Uganda Bureau of Statistics (UBOS) offices on Sixth Street in Industrial Area. This is the third time UNRA is shortlisting candidates. In total, UNRA has so far shortlisted about 3,900 candidates for the various jobs that the roads body advertised in January. The recent candidates have been shortlisted for posts in 31 categories with posts for registrars having the highest number of applicants at 194 candidates followed by weighbridge controllers at 187. Other posts include; accountants, supplies officers, librarians, security officers, ICT systems officers, hardware network officers, as well as personal, records, accounts, office and administrative assistants. Other positions are; bridges and structures engineers, geotechnical engineers, network planning managers, survey technicians, project engineers, project formulation engineers and safeguard officers. Others are; weighbridge technicians, ferry mechanics, ferry masters, ferry attendants, corporate branding officers, corporate strategy officers, media relations officers, client care officers, procurement managers and materials technicians. The shortlisted candidates are expected to sit for aptitude and competence tests between 8:00am and 4:00pm, according to UNRA. In the second shortlist, applicants were shortlisted for jobs in 22 categories. The second shortlist follows the first list released on March 17, where over 700 people who applied for UNRA jobs were shortlisted. Like it was the case with the first shortlist, names of the applicants who have been shortlisted have been published on the UNRA website. “UNRA would like to inform the general public that the shortlisting exercise commenced and the shortlists are being released in phases,” UNRA said in a statement earlier. In the second shortlist, the post of maintenance technician had the highest number of candidates with 279 applicants shortlisted. UNRA also shortlisted; drainage engineers, pavement specialists, drainage engineers, maintenance design engineers, materials engineers, surveyors, road maintenance engineers and plant attendants. Others shortlisted are; bridges and structures engineers, road rehabilitation managers, senior land valuers, procurement officers, ferry engineers, ferry engineers, legal officers, electrical technicians, and compliance officers. The first shortlist had the post of ‘Land Acquisition Officer’ with the highest number of shortlisted applicants standing at 150 candidates. It was followed by the posts of; ferry engineer and mechanic, with each having 69 applicants shortlisted. UNRA noted that shortlisted candidates would be subjected to an aptitude and competence test whose dates and time would be communicated later to each of the candidate’s personal contacts (phones and e-mails) as presented to the roads body at the time of application. The advertisement for job applications at UNRA followed the sacking of the entire staff by the new management led by executive director, Allen Kagina, in a bid to restructure the roads body. The sacking of all UNRA’s 900 staff members in was prompted by numerous cases of corruption and fraud. Among the most prominent cases was the sh165b Mukono-Katosi road deal where sh24.7b was feared lost. The contractor, who claimed to be Eutaw Construction Company of US whereas it was not, allegedly used fraudulent bank and insurance documents to secure the 74km road deal. The deal was inked following a directive by the Works Minister, Eng. Abraham Byandala, to the acting UNRA executive director, Eng. Ssebbuga Kimeze, to expeditiously sign the deal before due diligence was done. Byandala and Kimeze together with several other UNRA staff implicated in the scandal have since lost their jobs and are facing prosecution in the Anti-Corruption Court. Who on earth is behind this road construction company Dott Services, favoured by government despite being apparently inefficient? Is it owned by ministers and brigadiers? How come no one in government seems ready to push Dott Services? And, was Unra in bed with Dott Services? These are some of the questions that came up when Works MINISTER JOHN BYABAGAMBI visited the probe commission on the Uganda National Roads Authority (UNRA) on October 13. The commission is chaired by Justice Catherine Bamugemereire, with Mary Kutesa as the lead counsel. Commissioners include Ben Okello Luwum, Patrick Rusonogoza, Abraham Nkata and Richard Mungati. Siraje Lubwama and Zahara Abigaba recorded the proceedings, and below are highlights of the exchanges. Kutesa: Please give your full names! Byabagambi: I am John Byabagambi. Kutesa: Please give your place of residence and what you do for a living. Byabagambi: I reside in Mutundwe; currently I am the minister of Works. Kutesa: Tell the commission where you were working in 2006. Byabagambi: I was appointed minister of state in the ministry of Works and Transport in charge of works. Kutesa: Would I be correct to conclude that you have therefore been a minister in transport and works Sector from 2006 to date? Kutesa: What are the main challenges in this entity? Byabagambi: They include recruitment, understaffing, and managerial challenges. Kutesa: Are there corruption-related challenges in this organisation? Byabagambi: I can’t rule it out. Kutesa: Did some corruption complaints ever come to you? Byabagambi: When you see procurement not ending, there must be corruption going on; when you see work not being started at the right time, or not doing the right work, then you must know that there is something wrong. So, corruption may not necessarily mean seeing somebody taking money. Kutesa: Did you notice that procurements took long? Byabagambi: Yes, I have to tell you that I think in 2009, as a ministry, we had to take a decision of even disbanding the whole contracts committee because there was nothing coming out of the pipeline as far as procurement was concerned. Kutesa: About Tororo-Mbale, Mbale-Soroti project, did you participate in any activity? Byabagambi: I was limited to only supervision and guidance. Kutesa: Read minute meeting 7.1 of March 16, 2011. Byabagambi: The project manager had responded to the contractor’s letter requesting to introduce a VOP [Variation Order Payment] clause in the contract. The project manager had rejected the request. Kutesa: [Why was it] that as soon as it had started, the contractor was already asking to introduce VOP? Byabagambi: If this contractor had been given a commencement letter three months before [and] he had not started work, he is entitled to the VOP. Bamugemereire: I want to know where you get your authority to assert that. Byabagambi: These contracts are standard. If I am to start today, and my commencement letter is today, and you the client you don’t give me the right of way, the drawings, you don’t give me the [maps], and I have got my idle equipments on site, whether we go for arbitration you will never get away with this. Kutesa: Who is supposed to pay? Byabagambi: Somebody who didn’t do his job and this is either the user department, or the consultant. Kutesa: When you say user department or consultant, who are you referring to? Byabagambi: The user department is Unra which was responsible for this project. Now, why I am touching the consultant is that he works on behalf of the user department. I can’t envisage somebody giving a commencement letter when you are not ready to give [the maps] or the drawings; this is abnormal. Kutesa: When you noted these abnormal acts, what did you do as a supervisor? Byabagambi: We had a meeting which took place in the ministry, chaired by my boss and we were concerned at the delay of this project. Kutesa: What was your guidance and to who in particular? Byabagambi: I wrote a letter that they should sit and resolve these issues and get the contract started. The meeting we had was chaired by my boss, Hon Byandala, attended by many including me. Kutesa: In that discussion, was there any comment made [on] the effectiveness of the contractor? Byabagambi: Mostly we wanted the blame game to end between the contractor and the user department because the contractor was saying I have not received the instructions. And the consultant was saying what is contained in the BOQ is enough. Kutesa: [Read] the second letter I gave you. Kutesa: Who is delaying progress of work as far as that letter is concerned? Byabagambi: This is now the contractor but I don’t know the duration time he was supposed to spend on this section. Kutesa: But we can gauge clearly that the consultant had moved ahead in providing designs and the contractor was behind schedule. Byabagambi: Yes, but also I need to know what period he had given them to work on this section. Kutesa: Get these couple of other minutes. Let’s start with the date. Byabagambi: This is the date of 19th April 2012. Minute 3.2 says: “It was noted that the breakdown of the crushers for the contractor were still too frequent”. The fault goes to the contractor but you should know that a contract is holistic; the crusher might break down while the earthworks are moving on. Byabagambi: “It was observed that the progress of works was still very slow compared to what was expected under the contract and there was still a lot of room for improvement; the frequent breakdown of some equipment was affecting the progress on the culverts works. The contractor was yet to submit his proposed dressing surface design to the project manager”. Kutesa: Let’s go to minute 18 of 16th August 2012. Byabagambi: The contractor tabled a list of his equipment on the site. He had not mobilized any new equipment to the site. Byabagambi: The contractor had not submitted his program of works as requested by a project manager after the award of extension of time. Kutesa: What did the meeting note that was slowing down the progress as per minutes No.1 to 4? Byabagambi: The contractor has used 14 millimeter chippings on all the trials; none had been carried out with 10 millimeter chippings. Kutesa: Let’s go to 3.5. Kutesa: Year to year, site meeting after site meeting there was a problem of equipment from this contractor. Byabagambi: I don’t attribute the delay of this project only on equipments because when you look at the bills of quantities initially they provided the equipments which they knew will not be enough for that work. Secondly, there was a variation in the scope of works. Kutesa: But the consultant advised that there was no change of scope but only change of quantities. This is somebody who had been paid Shs 4.5bn to advise government. Why were supervising authorities and the executives at UNRA not putting their feet down to tell this contractor to do his work and stop dancing around? Byabagambi: The moment you change the scope of works, then the quantities are bound to increase or decrease. Byabagambi: Everybody had his own obligations to fulfill. A contractor follows the bills of quantities. If they are defective, automatically, the contract will also go wrong. Kutesa: What were the minister’s recommendations at [a meeting that took place at the ministry boardroom]? Byabagambi: The minister instructed Unra to be submitting to him weekly updates on the progress of issues discussed and the progress of the project in general. Kutesa: Point out one minute where you or your minister told the contractor to do their work or to make sure they have enough equipment or personnel or to make sure work progress was moving as expected. Byabagambi: Well, law is law and engineering is engineering; but I think they can be compatible. Kutesa: How is it possible that the others were told to do ABC but [on] Dott [everyone is] silent? Byabagambi: If a contractor is to work, you as a supervisor must force that contractor to work. The moment you relax on a contractor, he will always look for a way to get free money. Kutesa: There is ample evidence that this consultant did all he could; he wrote as many letters to Unra, to everybody, he could write to force this contractor to do his work and at all times Unra sided with the contractor; what is your opinion? Byabagambi: The moment they changed the contract of this consultant from a lump sum figure to a time-bound figure, things went wrong. By the way, I know this consultant very well. In 2003, we had the same scenario. Busunju-Hoima road had delayed for almost two years. Dott Services; we still have a problem with him on the two-year delays on Kafu-Masindi road. On Kagamba, he is still struggling. Here you are saying that law is law, for us in engineering that is why we have our own arbitration. Bamugemereire: Let me bring an interesting view to this discussion. If someone was to allege that the reason the contractor got away with it and Unra the employer appear to agree with the contractor as against the consultant was because Unra was in bed with the contractor; that is an allegation. Byabagambi: That is a different matter altogether. Why I am trying to separate the two issues, I was talking from the technical side why work can delay and what the consultant was doing. Therefore, even if there is an allegation of corruption that they were in bed, still the user department is to answer why he was in bed. Bamugemereire: Why should the contractor not answer as well, because this is Ugandan money; we’re supposed to protect it. Byabagambi: Me, I am trying to look for who is supposed to take the blame. Kutesa: You wrote a letter in 2012, today is 2015. You were state minister then, you are full minister today. Have you ever held anybody responsible for that fault? Byabagambi: I can’t say directly that I did that because the law is very clear how to resolve those issues. First and foremost, as Byabagambi I don’t even have powers even to sack. Byabagambi: But I have been complaining, everywhere maybe to sue; But you see, madam, my lord, even if you are a minister, even if you complain, the moment you [the executive director] keep quiet and keep it under [your] table so that the minister can forget, [it is] an indication that it is either insubordination or you are in bed. Kutesa: Your people wrote a letter to the Solicitor General saying we want to pay Shs 30bn to the advisers and the Solicitor General responded and asked for an explanation where the 509 days come from. The people you supervise did not answer. As a supervisor, what is your comment on all this impunity? Byabagambi: I can see this is impunity… and actually they should have written back to the Solicitor General giving justification so that he can allow the payment. Kutesa: Shs 30bn has been availed, how are you going to defend its purpose? Byabagambi: That is the whole question that I need to dig out now that I am aware of it. Kutesa: All these payments were made after the consultant had rejected them. Do you wish to give an explanation on which this Commission can rely, that actually the involvement of the minister – changing this project from this department to another, bringing in of another consultant – was actually not decided by the entire team? Byabagambi: These departments are staffed differently. I am trying to get what forced my minister to do it. The operations are well staffed and in projects there are very few people. I am sure what he looked at was who could do it because you would find an engineer with five to ten jobs. Kutesa: From the documents, this [first] team refused. The next team that was brought in agreed with the consultant to authorize these payments. Is this not too obvious? Byabagambi: I think we need to go into more details because being engineers they are guided by their principle of contractual obligations which they are supposed to follow. Kutesa: Are you aware that this authority you supervise has [not] got the regulations they are supposed to get under the Uganda National Roads Authority Act? Byabagambi: I think those regulations were not yet formulated or were being formulated. I remember the board had put on a consultant to formulate those regulations. Kutesa: You think eight years is a short time? Byabagambi: Well, we have made some laws in this country taking 20 years. Kutesa: Is that a practice to go by? Byabagambi: I hear that even in the High court there are backlogs. Kutesa: You are also among others mandated to make land requisition policies; do you know if these are in place? Byabagambi: I think it was among those regulations to be made. The general law we use is the Land Act. Kutesa: Answer what you know. It would have been approved by yourself if it does exist, have you passed one yourself or your predecessors? Byabagambi: I think the government has got a policy on land acquisition. Kutesa: We are talking about the Uganda National Roads Authority. Byabagambi: That is part of government. Kutesa: The law is very specific on this one. Byabagambi: What I know very well, the regulations were not yet concluded. Kutesa: This Commission has looked in depth at about six major roads and on each of them there has been overpayment or variation of price, extension of time by more than 150 percent, absolute nightmares, land acquisition issues, and in all those Auditor General’s reports saying this is wrong. Why is it happening? Byabagambi: If I don’t acquire land in time, if there is no money to compensate the owner of the land, then automatically you know you are going to land into trouble because the contractor is already there. Bamugemereire: Why is the contractor already on the site when you are still acquiring land? Byabagambi: We administer cash budget, that is our policy. Therefore, when I acquire a section of land and the contractor starts, as he is moving on to another section, one person says ‘I don’t agree with this price, I can’t accept the money’, then he puts an injunction on the work. Then you go for litigation. Automatically [by the fact] that man’s equipment is idle and under the contractual obligations, you will have to pay. Number two, I am expecting some money to come and because of budgetary cuts, that money is no longer there but a contractor is there. I can’t lift him off. So, you are likely to incur extensions and extra costs. At the same time, we deal with estimates in engineering; it is not like law where a comma or full stop is supposed to be here and that is it. Kutesa: On several occasions contractors are advanced money. Byabagambi: That is very wrong. Kutesa: Out of the six roads that this Commission has looked at in detail, there is an average loss of Shs 137bn on each road. Byabagambi: I don’t know how you arrived at that, you need also to justify it to me that the way you arrived at it is right because some of what you are calling a loss in roads may not be a loss as such. Kutesa: We have just given you a very simple example of Shs 30bn compensation in 500 days. Byabagambi: Even that figure itself I don’t know whether there could be a true component to be paid. Kutesa: As a supervisor, if you did not realise this, it is your fault; I am through with the witness. Mungati: The original contract was 18 months. It is a regulation in PPDA that all contracts after 18 months do not attract VOP. This contractor within three months had applied for VOP. Byabagambi: If it is a fixed contract of 18 months, it means the scope of work is going to remain the same for 18 months but if within three months you as a user department you come and say I am changing the scope of works, then you opening a Pandora’s box for yourself. Mungati: All these favours on Dott Services, can you make us understand who exactly this Dott is? We understand the owners of Dott are ministers; you could be among them. Byabagambi: State so that I am among them. Mungati: We have brigadiers, particularly Brig Mugyenyi; can you actually give us some indications on who this Dott is that you have been dealing with for several years? Byabagambi: There are many allegations here; but I am not here to speculate. Sometimes you hear somebody saying that Byabagambi is a multitrillionaire with structures somewhere. You know these journalists can write whatever they like. Rusongoza: I understand you are an engineer, which branch of engineering are you in? Byabagambi: I am a chemical engineer by the way. I have master’s degree in chemical engineering from Muscat University. Bamugemereire: Do you speak Russian? Byabagambi: To some extent I do but I have forgotten most of it. When I finished my St Henry’s College Kitovu HSC; I was among the 13 that got a scholarship to Moscow. Members of parliament on the Water and Sanitation (WASH) committee have tested the reality of the bad state of roads in Buhweju district. The MPs got stuck for close to six hours this morning along the 28 kilometer Kyankanda-Karungu-Bitsya road stretch during their monitoring tour of the water and environment projects in the district. The legislators had to push their vehicle out of the mud with the help of residents. The committee members included Hatwibu Katoto, Julius Maganda, and Ephraim Biraro. The road is cut off between Kyankanda and Karungu because of flooding. The Burere-Nsiika route is also unmotorable because of a damaged bridge. Maganda, the Bugwe North MP said the district needs heavy earth movers to tackle the poor road network. Richard Busingye, the Uganda National Roads Authority Mbarara Station Engineer blames the poor state of the roads in the district on the hilly terrain. The bad roads hurt traders mostly as transport trucks ferrying tea, matooke, and timber always get stuck especially during wet weather conditions. Alex Muhangi, a truck driver says the roads have worsened because of the torrential rains that have been pounding the district since July. He says the most affected are dealers of fresh agricultural produce like tea, cabbages and tomatoes. Mable Kirabo, a vegetable dealer from Buhweju district says besides escalating transport cost, the poor state of roads affects the timely supply of their produce to the market. Kirabo says sometimes she gets stuck on the way until her cabbages go bad before she reaches the market. 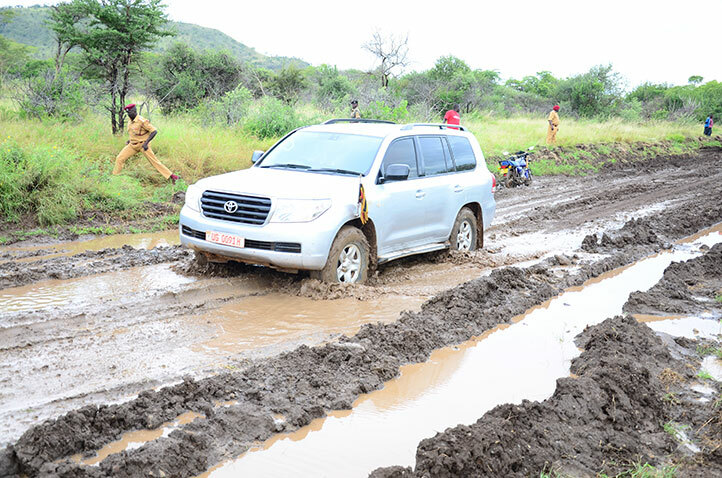 In November 2011, President Museveni’s convoy also got stuck in the same district on the same road in Rugongo village in Karungu sub-county, after the roads became extremely muddy, slippery and impassable following a heavy downpour, forcing him to trek more than four kilometres in the mud, and his bodyguards to carry his mobile toilet. Museveni had travelled to commission Tumu hospital in Karungu and had flown to Buhweju by helicopter and landed at Karungu Central Primary School, from where he was to drive for over five kilometres to the hospital. However, the vehicles were only able to cover one kilometre before they got completely stuck in the mud. He alighted from his car and decided to walk the rest of the journey. witnessed in the project are unacceptable. The World Bank on Monday, 21/12/2015, cancelled funding for a Uganda transport initiative, citing environmental concerns and allegations of sexual misconduct by contractors working on the project. The cancelation, a rarity for the development bank, came after an early review of the Uganda Transport Sector Development Project uncovered numerous problems, the bank said. "The multiple failures we've seen in this project -- on the part of the World Bank, the government of Uganda, and a government contractor -– are unacceptable," said World Bank President Jim Yong Kim. "It is our obligation to properly supervise all investment projects to ensure that the poor and vulnerable are protected in our work. In this case, we did not." The bank took action following complaints received by an independent board. Communities in western Uganda had complained of negative environmental and social impacts from the project's construction, including worrisome impacts on road safety. The complaint also outlined "serious allegations of road workers' sexual relations with minor girls in the community, and sexual harassment of female employees," the World Bank said. The World Bank said it suspended financing of the project in late October and canceled it on December 17 after the Uganda government and the government contractor failed to take corrective steps. The project, which aimed to improve Uganda's road network and road management system, was seen rising to maximum funding of $265 million. In addition to canceling the project, the World Bank said it would review other World Bank programs in Uganda and other countries to make "needed improvements." Canceling projects is rare for the World Bank. A bank spokesperson told AFP that the bank ended a $1.2 billion bridge project in Bangladesh in 2012 following accusations of corruption. The World Bank in February 2014 suspended a $90 million loan to Uganda following the African country's enactment of a harsh anti-gay law. Uganda National Roads Authority (Unra) awarded businessman Ephraim Ntaganda Shs 18bn in compensation for his 2.5 acres located in Lubigi wetland. The compensation, approved by the Ministry of Works and Transport includes; Shs 8.8bn for loss of business in three years even though no business was in place for the construction of Entebbe Express Highway. It also included Shs 4bn in disturbance costs, Shs 1bn in land-take arising from severance among others. Unra Commission of Inquiry is questioning how the Shs 18bn figure was arrived at. Ntaganda told the commission that he purchased the said land in 2012 with a plan to start a soap factory, but his plan could not be achieved because of the construction of the Entebbe Express Highway. In 2013 gazetted all protected lands including forests and wetlands. “I had this business plan in mind way before the proposed construction of the Highway and I had projected profits that would accrue from the business. That was the basis of the figures I asked for as compensation for loss of business,” Ntaganda said. Evidence before the commission however shows that Ntaganda's planned Excellent Assorted Manufacturers Ltd was never cleared by the National Environment Management Authority (NEMA). NEMA Executive Director, Dr Tom Okurut says the application for a soap factory to be constructed on the said wetland was made but never 'cleared'. Instead, NEMA certified Ntaganda to change his Hides and Skin warehouse near the Busega Wetland into the soap factory. “Our certificate was clear, the factory was to be set up on dry land and not in the wetland and we instructed him to first construct a waste treatment plant,” Okurut said. Richard Mungati, one of the probe commissioners says the financial audit of the Skin and Hide business should have been used as a formula for the amount to be paid in compensation for loss of business. "I think this evaluation of yours, I think, you just have to accept that it is based on fake figures. The cash flows that you have used as a basis for your compensation are unrealistic and as such I think they’re kind of speculative." "Otherwise, you would have first of all referred to the real figures that have come from the audited financial statements where they have made profits. Because if they have made profits, they would kind of indicate the net cash flow flowing in into the business. And then you would have used that figure maybe projected for the next few years and then use that as a basis for the calculation of the business losses but you have not demonstrated this at all", Mungati said. The Chief Government Valuer, Moses Magala says he used the international standards and formula of calculation to come up with the business loss. General’s office, appears before the UNRA probe yesterday. Former managers of the Uganda National Roads Authority (UNRA) are liable for criminal prosecution for allegedly causing financial loss in billions of shillings during the construction of two roads in eastern region, the Solicitor General has said. It is alleged that the construction of Mbale–Soroti and Tororo–Mbale roads resulted in loss of Shs100billion due to delays to provide designs and leaving idle equipment on site. While appearing before the commission of inquiry into allegations of mismanagement, abuse of office and corrupt practices in UNRA, Mr Christopher Gashirabake, the director of Legal Advisory Services in the Solicitor General’s office, said although former UNRA managers left office, they are still criminally liable. Mr Gashirabake also testified that UNRA executive director, Mr Ssebugga Kimeze, concealed documents from a consulting firm, GIBB Africa Limited, which had advised the roads agency on the amount to be paid upon extension of time. “To clear a contract, we rely on documents provided by the client. If we cleared a contract with conditions and they are not rectified, that is contrary to the advice of the Solicitor General,” said Mr Gashirabake. About what sanctions to take upon receiving contrary information, Mr Gashirabake said they would seek advice from other arms of government. 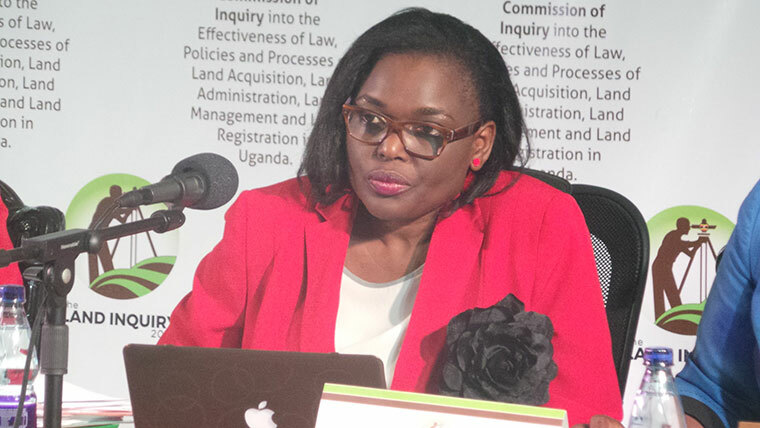 Ms Cornelia K Sabiiti, the executive director of the Public Procurement Disposal of Public Assets Authority (PPDA), said they approved payments based on the documents provided by UNRA. She also attributed the delayed contract to poor planning where UNRA mobilised a contractor on site without the designs. Former director of planning David Luyimbazi was quizzed in regard to failure to provide designs and properly plan for the project leading to delays. He, however, shifted the blame to the Procurement and Disposal Unit (PDU), project manager and the consultant for failing to execute their roles. Mr Patrick Muhumuza, the former manager in charge of administration, said all the parties involved are to blame for failing to execute their duties. Deputy lead counsel, Mary Kutesa said they have summoned former executive director Sebugga Kimeze and Mr James Okiror (director projects) to appear before the commission today. Led by Justice Catherine Bamugemereire, the Commission is investigating the handling of civil works, contracts management, the handling of more roads and areas of procurement at UNRA since its inception to date. MISS WAIGURU OF KENYA, BOUGHT A PALATIAL HOUSE IN BIRMINGHAM, UNITED KINGDOM, UNDER HER SON’S NAME. The beautiful house in the UK. 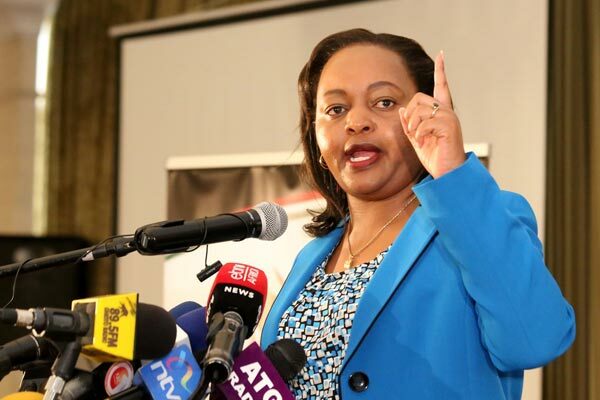 Thursday, December 3, 2015 – Immediate former Devolution Cabinet Secretary, Miss Anne Waiguru, reportedly bought a palatial house in the United Kingdom and registered it under the name of her eldest son, Ian, The Kenyan DAILY POST can authoritatively report. According to an official of the Ethics and Anti-Corruption Commission (EACC) who was part of the team that raided Waiguru’s new house in Kitisuru on Monday, they found ownership documents of a house situated in the leafy suburbs of Birmingham, UK, that was acquired almost the same time that Waiguru acquired the Kitisuru one before moving from Runda. The official who requested anonymity said that they took the documents to establish the details of the firms involved in the transaction and the value of the property which is estimated to have cost the corrupt Minister millions of Euros. On Monday, an army of detectives from EACC raided Waiguru’s posh house in Kitisuru and ransacked the house for seven hours looking for evidence to enable them prosecute the corrupt ex-CS. The official said that the detectives were not only looking for documents relating to her work in the Ministry but also to her previous jobs and how much she made before joining the Cabinet in 2013. He said Waiguru will be arrested soon over the loss of billions from her Ministry. Waiguru is among Government officials who have been issued with Visa bans and it will now be impossible to access her house. A UA divisional Court Martial sitting in the Somali capital Mogadishu has sent nine soldiers serving under the African Union Mission in Somalia (Amisom) to prison for theft of operational material. A statement released by Amisom information desk yesterday said the Ugandan soldiers were found guilty of pursuing personal interest and endangering operational efficiency of the UA. “The prosecution has proved all the accusations of pursuing personal interest and endangering operational efficiency beyond reasonable doubt. The accused persons are hereby convicted of the charges against them...,” Brig Olum told the soldiers. Three of the soldiers were also dismissed with disgrace, meaning they leave the army without any benefits, the statement said, adding that all nine soldiers will serve their sentences from Luzira prison. The defence counsel, Lt Lilian Tugume, pleaded for a lighter sentence on the grounds that all the nine were first time offenders and had shown remorse. However, Brig Olum defended the penalties. He noted that the soldiers had not only damaged the image of the UA and Amisom with their selfish pursuits, but had also endangered the lives of others. The nine were charged after five soldiers were arrested in June, in connection with the illicit sale of fuel in a scam involving civilians in Mogadishu. However, according to the statement, two of the 18 pleaded guilty and were immediately charged. Another six were acquitted, while one turned into a state witness. This left the nine, who had denied any wrongdoing, to face trial.